Demand for social housing is very high – swapping houses can be a good way to find a new home without spending a long time on a waiting list for an empty property. 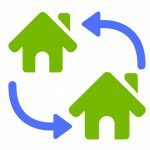 A transfer is when tenants move from one Tuntum property to another. If this is something you are interested in, please contact us or call 0115 916 6066 for further information. Your reasons for wanting to move to a different home will be considered and, depending on your circumstances, we will advise you of the options available to you. We may refer you to the Local Authority, depending on the type and location of property you require. Are you or a family member thinking of downsizing? Have you considered sheltered housing? A mutual exchange is when tenants with different landlords swap houses. Permission from both landlords is required before a move can take place, and remember – you will take over the other person’s tenancy as their property. Who can do a mutual exchange? Any secure or assured tenant of Tuntum or another social landlord can carry out a mutual exchange. Tenants on starter tenancies cannot exchange. Check with your housing officer what type of tenancy you have before you apply. Homeswapper is a nation-wide mutual exchange website. You can register online, and search for properties to exchange with. Registration is free, easy and secure. The site can provide you with updates and possible matches by email, text message or your on-site account. Your details will stay on the system for three months from the date you register. After that date, you will have to register again. Tenants can also find a person to exchange with outside of these schemes. If you do find a successful match, then all parties will need to contact their landlord(s) in order to make an application. Some Local Authorities offer mutual exchange schemes in their area. You will need to contact your local council directly in order to make an application. You and your exchange partner(s) need to get written permission from both your landlord(s). You can download a Request Form here, or call Customer Services on 0115 916 6066 to request one by post. We recommend that you read through the Mutual Exchange policy below, which outlines the procedure in more detail. Your Housing Officer will assess your application and contact you to arrange a home visit within 10 days of receiving your form. They will arrange to inspect your property, garden and any outbuildings or garage. You will be informed of our decision in writing within 42 days if your application. You have the right to appeal if you do not agree with the decision that has been made. What happens if the exchange is approved? An appointment will be made for you and your exchange partner(s) to visit the housing office to sign a Deed of Assignment. This will transfer your tenancy to the new person. If you will move to another landlord, you will also have to sign a deed to transfer their tenancy to you. All parties will then need to arrange to move home. It is essential that you do not move properties until the Deed of assignment has been completed.